Toronto and Rochester have been interconnected as long as their histories have been recorded, yet it appears that is the Toronto to Rochester ferry that has brought the shared history of the two cities the most fame, or infamy. Their shared ferry boat history began in 1901 with the first two passenger and car ferries - the Toronto and the Kingston, operated by Canada Steamship Lines. They circled Lake Ontario each summer, stopping at Rochester late in the evenings. They were ultra-luxurious and very large. The Toronto could sleep about 330 passengers in its staterooms and the Kingston could sleep about 360. The Toronto made its last voyage from Rochester in the late 1930s and the Kingston continued on until 1949. The more famous ferry boats were the Ontario No. 1 and Ontario No. 2, coal freighters that also took passengers and vehicles on trips to Cobourg. The ships, operated by the Ontario Car Ferry Co., carried close to 1,000 passengers and during the greatest demand for ferry boat services in the 1920s, the ships carried 70,000 passengers a season. The Ontario No. 1 operated ferry service from 1907 – 1949 and the Ontario No. 2 from 1915 – 1950. Over the years talks about resurrecting a ferry service never amounted to anything until the 1990s when talks about a high speed ferry service between Toronto and Rochester began in earnest. In 2004 the Spirit of Ontario 1 launched a fast ferry service on an 82 nautical mile/94 miles/152 kms route across Lake Ontario. The Spirit of Ontario 1, nicknamed The Breeze, had capacity for 774 passengers with 238 car-equivalents. Its amenities included a cafeteria, two bars, two movie theatres, a children's play room, an arcade, television, and broadband Internet service provided via satellite. The Breeze offered one or two roundtrips daily between Toronto and Rochester with a total crossing time of 2.5 hours. Although the ferry service was slow to catch on within several months it was running at full capacity. Unfortunately, due to financial problems, the Spirit of Ontario 1 ferry service was suspended in September 2004 and the company operating the vessel declared bankruptcy. In February, 2005 a bankruptcy auction was held and the winning bid for the Spirit of Ontario 1 was the Rochester Ferry Company LLC, a subsidiary of the city of Rochester. 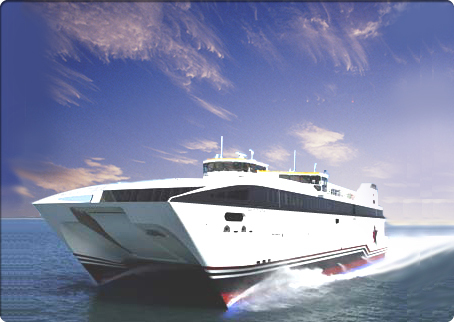 High speed ferry service between Rochester and Toronto resumed on June 30, 2005 when the Spirit of Ontario 1 was relaunched with a new nickname – The Cat. The ferry service was scheduled to run year-round, however in December, 2005, the company operating the Toronto to Rochester ferry announced that it would be suspending service for the winter. Their plan was to charter the Spirit of Ontario 1 for ferry service in the Caribbean during the cold weather months. That was the death knoll for the fast ferry service. In January, 2006 the mayor of Rochester announced that the city would not approve the ferry board's request for additional funding so that the service could resume in the summer. In April, 2007 the Rochester Ferry Company LLC announced that it had successfully negotiated sale of the Spirit of Ontario 1 to the German company Förde Reederei Seetouristik Gmbh for service between Tarifa, Spain and Tangier, Morocco. Will Toronto and Rochester ever again be connected by a high speed ferry service? Stay tuned. Did you know that there have also been ferries between Toronto and Niagara? To read more, click here.